All Canvasflow text components are designed to be fully customised to ensure you can match your exact style requirements. Font: Any font enabled on your account can be applied to a text component, the latest custom fonts will always appear at the bottom of the list. Size: Change the size of any text component. 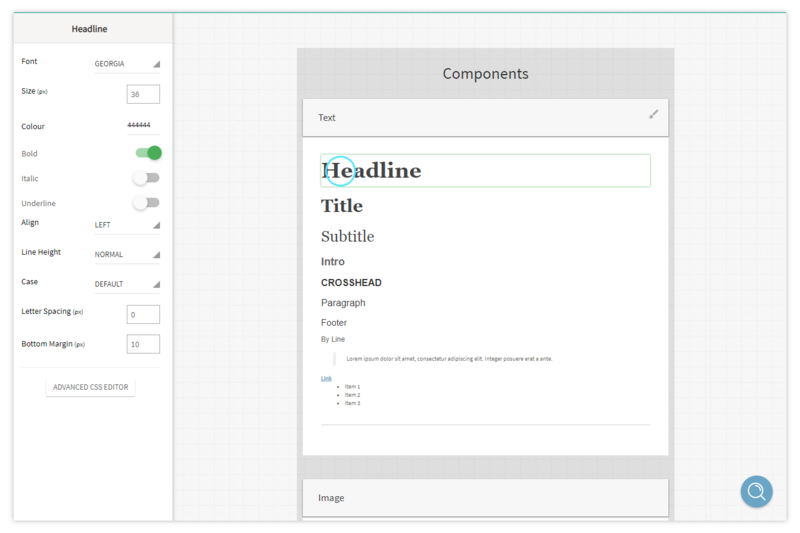 Bold, Italic, Underline: Set the default formatting of any text component, these can also be done using the text formatting tool in the article builder by highlighting and right clicking text. Align: By default text will be left aligned. This can be changed to Centre, Right, or Justify. Justification is when spaces between words are are stretched or compressed to ensure that text fits flush with both the left and right margins. Line Height: Dictates the vertical padding between lines of text. Case: Change the default case of text, such as UPPERCASE, lowercase, Capitalise. Letter Spacing: Change spacing between individually letters. Bottom Margin: The size of the bottom margin under each text line.